My son entered his freshman year in high school 2 weeks ago (no that’s not him pictured above). The school is a 10 minute drive from Columbine High School in Littleton, Colorado – the site of the nation’s worst school shooting tragedy in April 1999. Our community has never forgotten Columbine. We are reminded of it in so many ways, large and small. I was reminded of one of the big and positive ways last night. 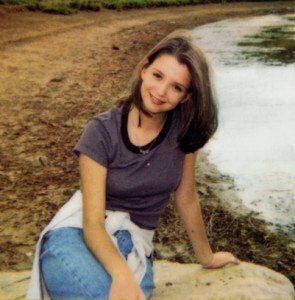 Rachel Joy Scott (pictured above) was the first victim that day, shot as she was sitting outside sharing lunch with a friend. An avid journal-writer, Rachel wrote an essay weeks before her death speaking passionately about the principles she wanted to live by. It reflected an amazing and inspiring awareness for anyone – even a wide-eyed optimistic 17-year-old girl. After her death, her father translated her journal writings into a inspirational program for building school cultures of positive “chain reactions.” It has sparked a nationwide movement to prevent Columbine tragedies that has impacted over 16 million students, teachers, and faculty. I attended this presentation at my son’s school last night. It was deeply moving. While it was intended to be dramatic and delivered on that promise, it inspired me to re-examine the simple principles Rachel challenged herself to live, in my own life. They are simple ideals … nothing new here … but not always easy to practice in our daily lives. Today, in place of “culture tips” or a “culture success story” – I want to honor a young woman who stood for goodness until the day she died. To share what inspired me – and my son – to be a little bit better people. If it can inspire one good conversation with your team or leadership, then I’ve succeeded in creating a chain reaction – what Rachel stood for. 1) Eliminate prejudice – look for the best in others. The speaker last night reminded us we all have prejudice – it’s simply human to “pre-judge” someone. I work hard to guard against this in my own behavior, but my mind will sometimes take me there without my realizing it, in spite of my desire otherwise. How many times a day do you hear “Jack just threw me under the bus.” “I can’t believe Pat said that in the meeting, what an idiot.” So on and so on. I wish there were a chip I could install in the collective human brain to “Assume positive intent, first and always.” It would change everything. 2) Dare to dream. I’m a driven, true achievement-oriented woman. I’m constantly setting and re-setting goals. I dream a little too big at times (is there such a thing?). But I sometimes run up against my own resistance “What am I doing this for, really?” Whether it’s eating healthier or landing a big project on time, when I take a moment to connect with my bigger purpose for anything I have committed to … I write it down. Maybe this is the week you will take a risk, and discuss a loftier purpose among your team. Inspire yourselves by re-connecting to the emotionally compelling dream behind what you’re doing. 3) Choose positive influences – input determines output. I have role models. When was the last time I consciously chose one and sought to walk in their footsteps? For what reasons? I was most touched by this principle. Rachel’s vow was to reach out to the socially isolated – those who were new to school, teased and made fun of, or handicapped. That was an eye-opener … I really want to increase my commitment to be an example of service and inspiration for others, and seek role models who are doing this in their lives. If you relate, dust off your ambition to serve … it will leave a smile on your face every day. 4) Use kind words. I often find myself saying to my kids “It’s not what you say – it’s how you say it.” (ie, the same words can be loving or hateful depending on the tone and intention). The truth is, words are important – they are a primary medium of relationship. The words I choose can create a connection or break it. Taking an extra 30 seconds to form a response that is thoughtful and considers the other person’s feelings before I speak is a simple prescription for better relationships. In our busy society, we often see kindness and truth as either/or concepts. Either I’m kind and don’t tell the truth, OR I’m the “bad guy” and say it like it is. Rachel’s challenge has me considering how I can do both at the same time: Tell the truth AND be kind. In my opinion, the kindest and most under-used 4 words in the English language are “Great job” and “Thank you.” I try to weave them into every interaction. 5) Start a chain reaction. Just like “Pay it Forward” – when one person decides to be the change they want to see, change ripples to others. Every one of us has the realities of a troubled economy/financial system, a dysfunctional government, family conflicts. We all stew in the soup of good times and bad times – even those with lives of privilege. Rachel reminded me that being a bright spot often means going against the grain of popular opinion – because too often those negative” stories allow me to remain a victim. It’s about remembering what I stand for – a desire to connect people to their desire to make a difference. I am a ripple in a pond. Even if the stone I drop in is tiny, I want my stone to send out positive ripples. I see this truth constantly in culture change efforts: The people who embrace their desire to make a positive impact (and don’t see that in competition with delivering results) lift their teammates out of disconnected, dysfunctional confusion. This sets off a chain reaction. Those are the people who change cultures. So there you have it – the motivational part of me showing up to spread a little hope and cheer. Rachel’s Challenge is my stone in the pond today. May the ripples wash over you and inspire you to drop your own. Lisa Jackson is a corporate culture expert. She and her partner Gerry Schmidt teach leaders how to evolve their corporate cultures to perform better, innovate faster, and show they truly care about people in an unprecedented era of rapid change and transformation.